Look what came in the mail! I was super excited to receive this parcel! (All of the goodies can be found in Brenda Schweder's Etsy shop.) I got new accessories for my Now That's a Jig! and her new book, "Collaborate: Friends in the Making". The book is stunning and includes innovative collaborative efforts between her and some of her artist friends. The designs are really cutting-edge and are really wearable art. It was like getting a box of inspiration the mail! I can't wait to play with the new pegs! The book is packed with cool ideas and the new ring pegs will take the guesswork out of sizing (and making) consistent wire rings! 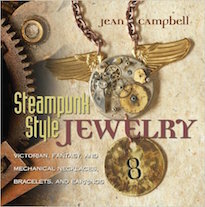 If you're interested in her new book or Now That's a Jig!, CLICK HERE to check out her Etsy shop. I highly recommend it! We've been super busy and have a lot of great activities planned. 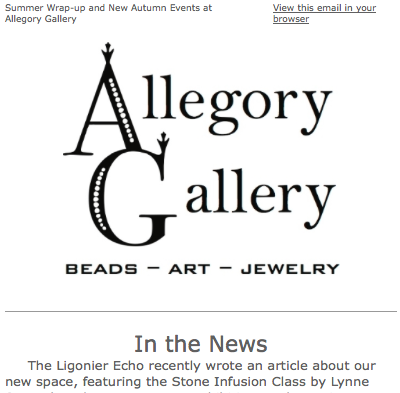 Did you see the latest newsletter from Allegory Gallery? It's all in there! The newsletter features recaps, current events at the shop, and projects in the works. CLICK HERE to see the web version and CLICK HERE to sign up for the mailing list. Yesterday was my birthday. I used to plan elaborate birthday parties and celebrate with true gusto. Nowadays, I use the day in a much more contemplative way and reflect back over the years. I think about all the things I have done and all the things I would like to do. While it isn't as festive, it grounds me and centers me. It reminds me of how far I've come and how far I'd like to go. Last year, we were still at our old location. We had finally finished renovating the Annex and had been running classes for a few months. I have to admit that I had an odd sensation of satisfaction. The store was doing well and the Annex was up and running after so much sweat and toil. In hindsight, it was the calm before the storm. Six months later (and after one of the most severe winters I have experienced), we decided to leave the old storefront, close the Annex, and start over in a new space. The transition was hard, but the rewards of taking the next step were ample and bountiful. We have been in the new shop for nearly half a year and I couldn't be happier. We didn't know what to expect when we moved, but the business has grown, become more established in the community, and continues to flourish. As I look back over the years, I see a steady stream of hard work. I see my calling. I see my passion. I think back on all the people I have met and the friendships I have made and forged all the stronger. I think back on all the beautiful things I have seen and all the things that I have made. I feel lucky. I feel full of gratitude. We have been blessed with such an outpouring of positive energy and support. It's hard to imagine that four years ago, I had been diagnosed with cancer and was facing treatment. It was a dark time and I couldn't have fathomed having a store then. It seemed like an impossible dream, that maybe... someday... might come true. As I look back, I see all the winding paths, connecting and unfurling... bringing me to this place. It is a good place. Thank you for being a part of this journey, of going with me and William into unknown territory and discovering happiness. The summer has been zooming by! Today is the Reveal for the August and September selections of the Inspired by Reading Book Club! For August, we read, "Stiff" by Mary Roach. For September, we read, "Lavinia" by Ursula K. LeGuin. We decided to combine the two most recent reveals. Both books were met with positive reviews. "Stiff" is a book about the second "lives" of cadavers. While it's a macabre topic, the author uses wit and humor to soften the gruesomeness. Fans of The Wizard of Earthsea books will recognize Ursula K. LeGuin's lyrical prose that boards on poetry. The focus of our selection features a minor character from the Aeneid, based in ancient Italy before the rise of the Rome, giving voice and life to a female character that is marginalized in the original. The book not only gives background and depth to the title character, but furthers her story and gives conclusion to the unfinished epic poem by Virgil. The meet-up was a lot of fun! Isn't it always though? Not only do we talk about the books, but we share our lives and take a night off to celebrate creativity. Since Lavinia was set in ancient Italy, Alison brought pizza! Laurel brought cake and sweets to celebrate my birthday and we had wine as well! Alison made this necklace for the August selection. Here's what she had to say about it: "I call this piece, "Heart and Soul". It is inspired by the ethics and morals underlaying the practice of using cadavers. I was inspired by this quote: "H is unique in that she is both a dead person and a patient on the way to surgery. She is what's known as a "beading-heart cadaver", alive and well everywhere but her brain, a body will not breathe on its own. But hook it up to a respirator and its heart will beat..." "... these afford her an opportunity most corpses do not have: that of extending the lives of two or three dying strangers." 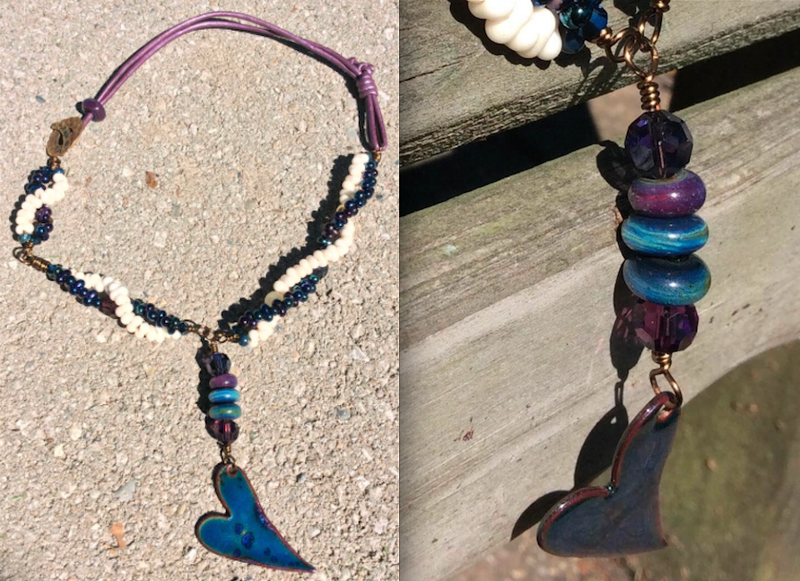 The necklace is made up of leather, a bronze toggle from Saki Silver, peanut beads, artisan lampwork glass, Swarovski crystal, and an enamel focal from C-Koop." 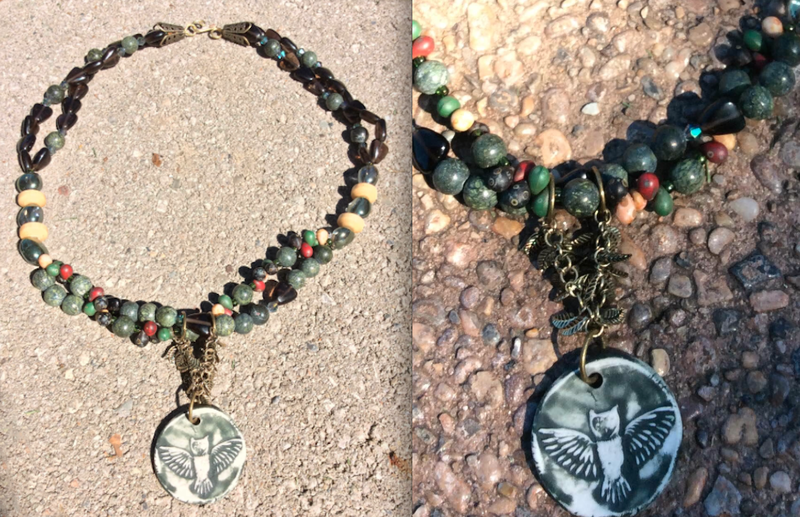 Laurel made this necklace inspired by the August selection. Here's what she had to say about it: "One of the funniest stories in the book is about a mixup in the postal service, when a box of groceries was received instead of the expected human remains! Imagine the surprise of the people who got the cadaver instead of their ham! I made the polymer clay components, marking the focal with the words: "contents unknown". The beads are supposed to represent the wooden boxes the parcels were shipped in. 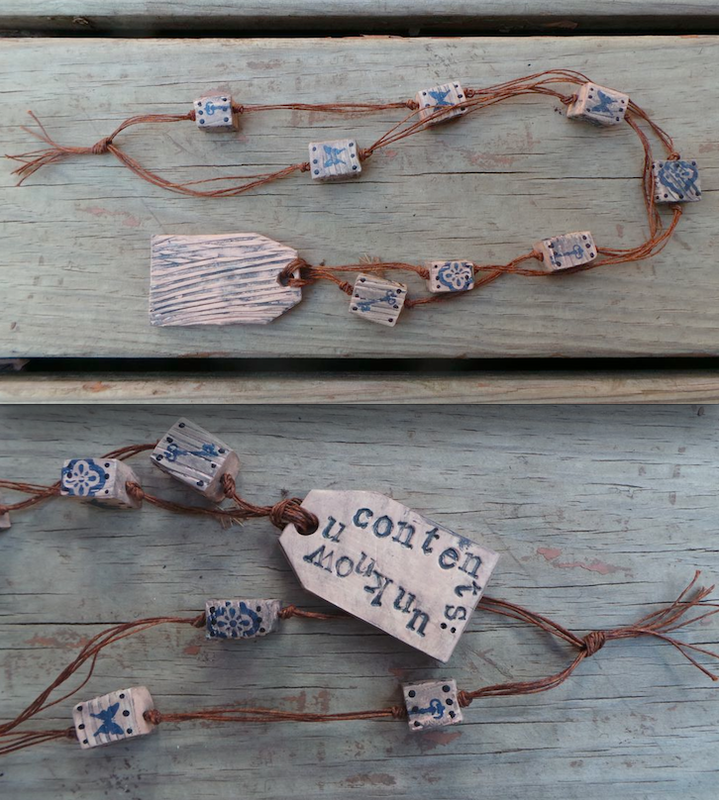 I strung the polymer clay beads on waxed Irish linen, to replicate the look of packing twine." 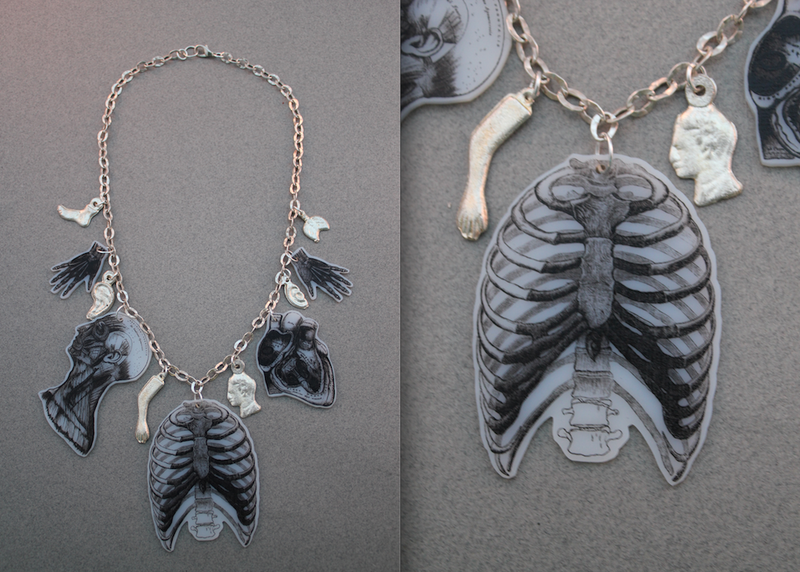 This is the necklace that I made for "Stiff". I dug out my copy of Gray's Anatomy and scanned in some anatomical illustrations. I printed the images on shrink film and popped them in the oven. I used the shrink plastic components with milagros of body parts like feet, ears, arms, heads, and lungs. 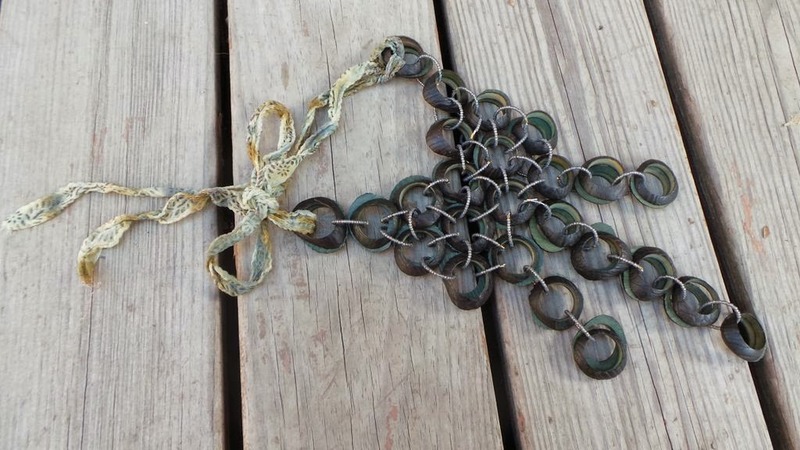 All the pieces were attached to a silver chain with jump rings. 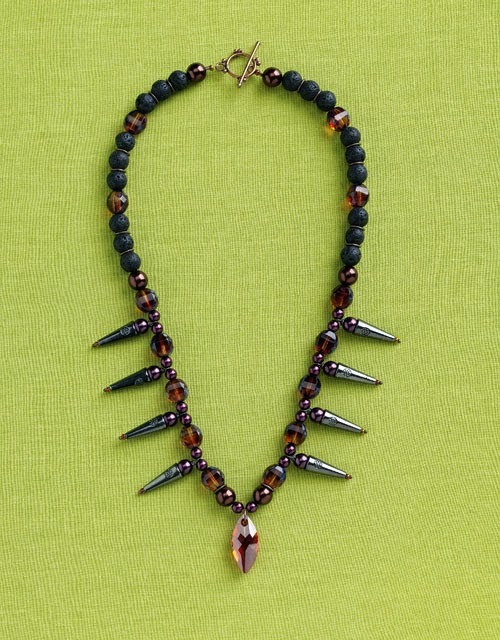 This necklace was made for the September selection by Alison. Here's what she had to say about it: "As promised, Lavinia never dies as she lives along with her poem. At the end of her human life, she is transformed into an owl. I was particularly inspired by this quote, "I fly among the trees on soft wings that make no sound. Sometimes I call out, but not in a human voice. My cry is soft and quavering: I, I, I cry: Go on, go. Only sometimes my soul wakes as a woman again, and then when I listen I can hear silence, and in the silence his voice." 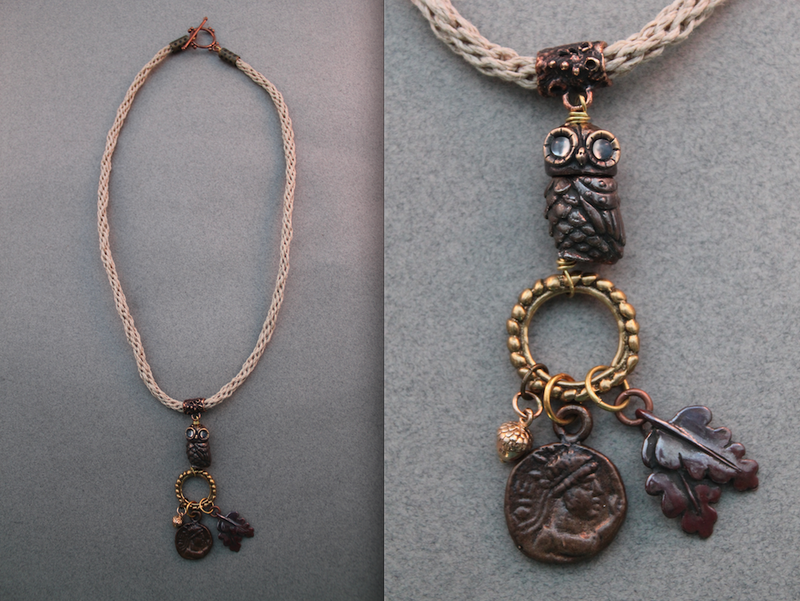 To make the necklace, I used one of Andrew's porcelain pendants featuring an owl, Czech glass, and leafy chain." This necklace was made by Laurel. Here's what she had to say about it: "The book features several battle scenes. I thought about chain maille armor and battle gear. I had this necklace made of these funky "O" rings and took it apart to make this new bib-style piece. I used silk ribbon with metallic stitching (in a leaf pattern) for the back of the necklace. To me, the leaves represent Lavinia's connection to nature." 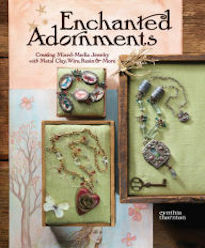 This necklace was made by me for the September book. For the base of the necklace, I used a kumihimo technique with hemp cord. From that, I hung an articulated mechanical owl from my family at Green Girl Studios. Cynthia gave it to me years ago as a birthday present and I held on to it for just the right project. At the bottom of the owl, I attached a bronze ring that I hung an acorn, an ancient coin replica, and shibuichi oak leaves. In the book, Lavinia goes into an old oak grove to pray and receive visions. The next book for the book club is "The Ocean at the End of the Lane" by Neil Gaiman. For this year's book list, CLICK HERE. The in-person meet up at Allegory Gallery is scheduled for Tuesday, October 28th! The next blog hop is planned for Wednesday, October 29th. If you're interested in keeping up with what we're doing, CLICK HERE to visit our Facebook page. We also have a Pinterest board with supplemental inspiration. CLICK HERE to visit that. I came in this morning to find a surprise! My friends, Laurel and Alison snuck into the shop and decorated for my birthday! They filled the shop with balloons, hung streamers, and wrapped the checkout desk in a festive tablecloth. 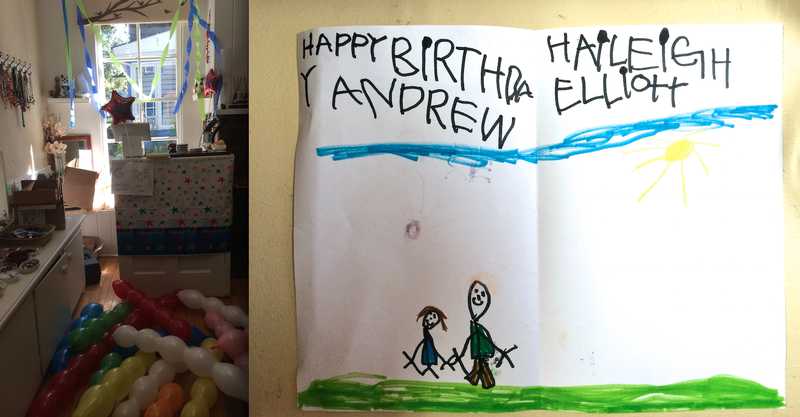 Laurel's daughter, Haileigh, made a card, featuring the two of us... including my shaved head and army green pants! It was a nice surprise to start the day with and I feel fortunate to have friends, who know how to make someone feel special! Thank you, Laurel and Alison! 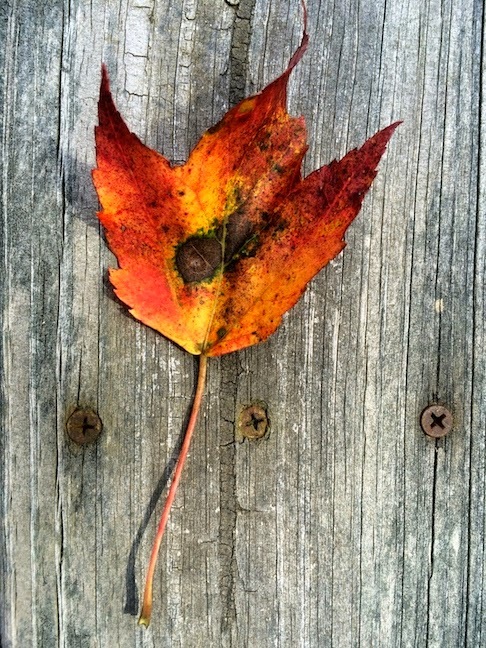 In Southwestern Pennsylvania, it's hard to ignore the signs that autumn is here. The leaves on the trees are becoming a blaze of buttered golds, burnt oranges and flaming reds. But I look for other signs too. One of my favorite harbingers of the fall season is the toad lily. I love the speckled flowers. They remind me orchids or miniature stargazer lilies. They always bloom around this time of year and I welcome their arrival. I remember showing my mom a picture of the flower, thinking that I would impress her with a beautiful flower that she wasn't familiar with. She just laughed and said, "This one comes from back home!" Upon doing a little research, she was right! 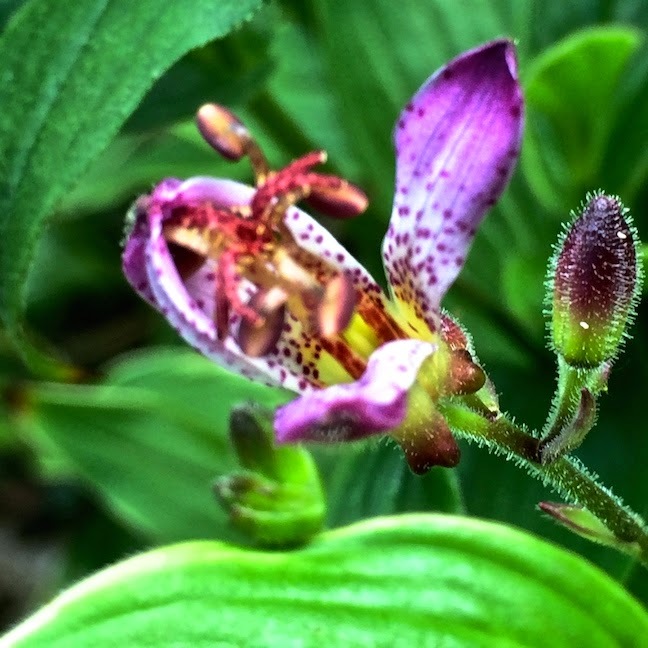 The toad lilies are originally from Asia and can be found from the Himalayas to the Philippines. The toad lilies and I have found each other, far from our roots on the other side of the world. We had a customer come in not too long ago with three broken necklaces. (I believe there was a rowdy dog involved in her story of how they came to be that way.) After we sat down and talked about what she wanted, we decided to remove the fractured pieces and consolidate the beads to form two necklaces. They can be worn together or separately. The necklace on the bottom layer, which is slightly longer and has all the large pieces, forms the foundation for the second necklace. The other necklace is a bit shorter and rests on top of the base necklace, filling out the collar of coral red. They come together to definitely form a statement piece! One of the issues of the other necklaces, which might have contributed to them breaking is that they were strung too tightly and didn't have spacer beads. Without the spacer beads, the necklaces were stiff and didn't drape as nicely as they could. So, between the coral sticks, I used some "ruby quartz crystal" beads that I've been hoarding. I've also heard them called, "red velvet" beads, but they are just a faceted leaded glass crystal that has a deep red color that deepens in the shadows and sparkles in the light. I'm quite pleased with the result! Even better, so is the customer! Don't forget! We're meeting up on Wednesday evening from 6PM to 9PM at Allegory Gallery for the in-person meet-up of the Inspired by Reading Book Club. 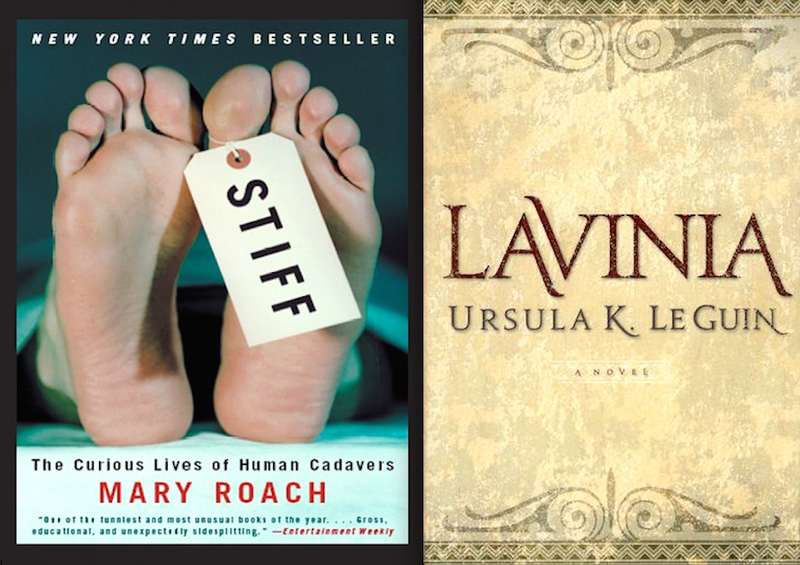 We postponed the August book discussion, so we'll be combining meetings for "Stiff" by Mary Roach and "Lavinia" by Ursula K. LeGuin. The blog hop is on Thursday, September 25th. 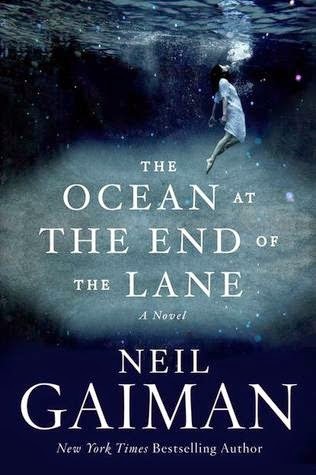 The October's book section is, "The Ocean at the End of the Lane" by Neil Gaiman. Hope you can play along! It is amazing what you can cast in an ice cube tray. Check out these superhero weapons! 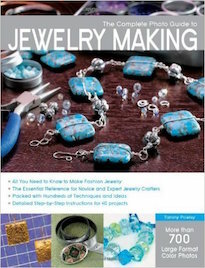 Cyndi's gathered up some of the best and most recent pieces of advice for jewelry-making and jewelry businesses from around the blogosphere! 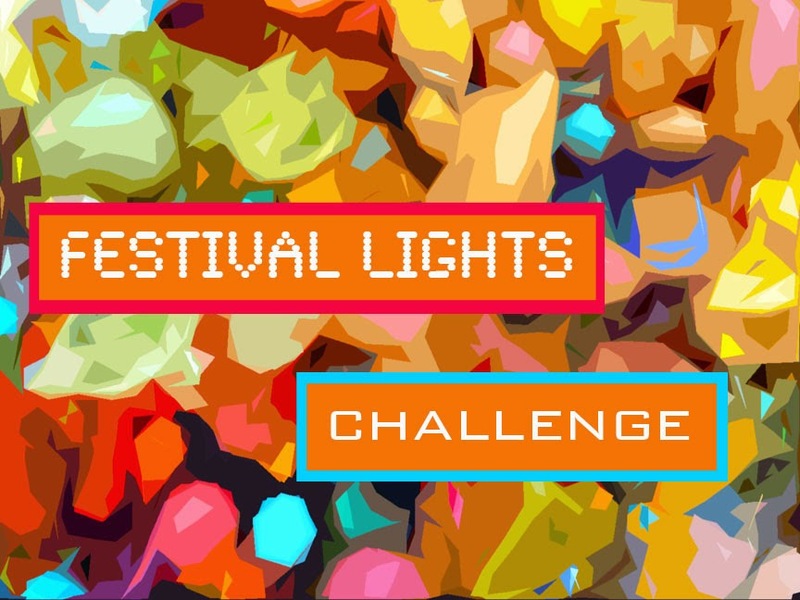 Today is the Reveal for the Festival Lights Challenge! Normally I do a recap of how the challenges work and show pictures of the kit and Mystery Component, but you can see that information by CLICKING HERE and HERE. We'll skip to the good part... the REVEAL! 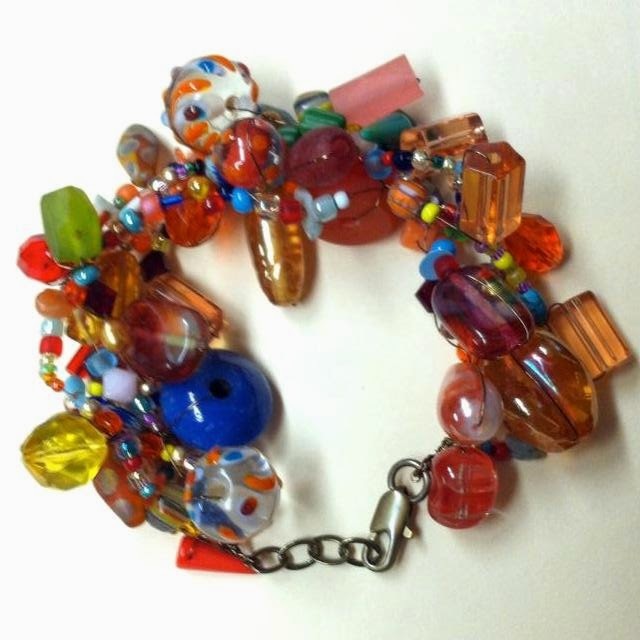 This bracelet was made by Ann Mergl! 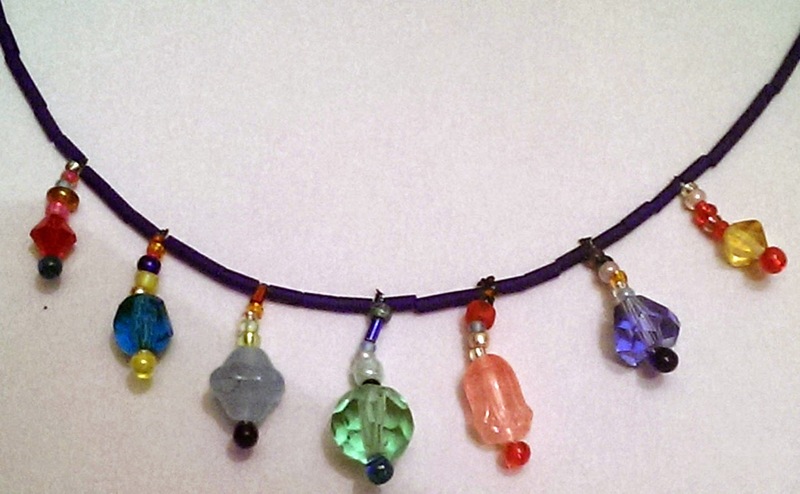 It features beads from the kit wired on to a length of chain for a fun, eclectic vibe. These earrings were made by Laurel Ross. 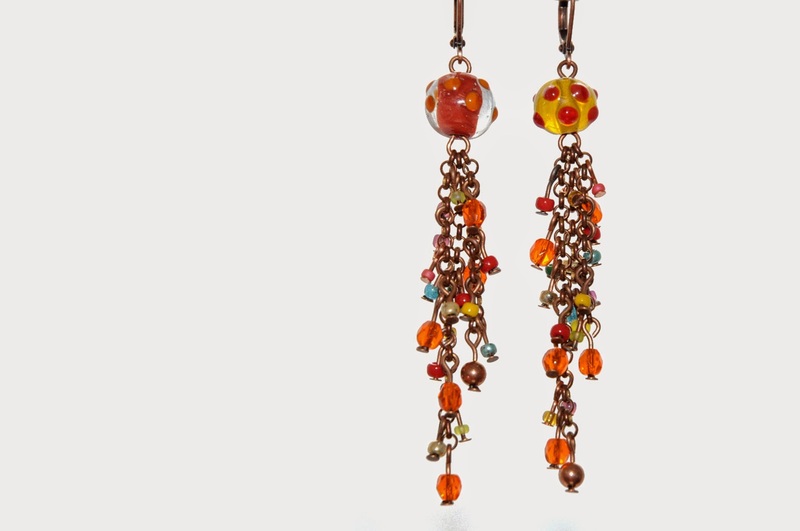 Here's what she had to say about them: "I normally make necklaces for my challenge pieces, so I wanted to go one step further and challenge myself by making a pair of earrings. I saw a picture on Pinterest and decided to do my own version. Thank you, Pinterest! I used seed beads from the mix and strung them up on flexible beading wire, created teardrop shapes and then used brass bells to cinch the points of the teardrops. They're colorful and bright!" 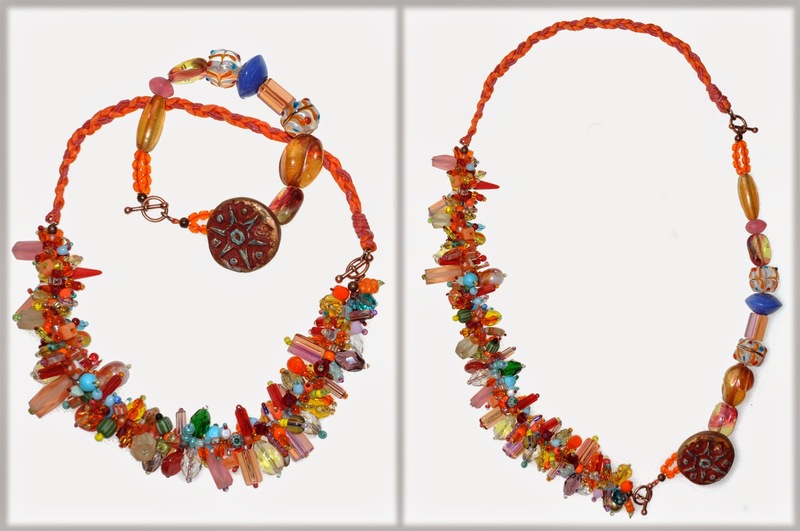 This necklace and matching pair of earrings were made by Cheryl Lee Tucker. Here's what's she had to say about them: "I struggled at first with this challenge. I guess that's why they call it a challenge! The multi-colored beads and varied sizes seemed too chaotic. Then I remembered when I read about the lights and music on a midway! MORE IS MORE! So my "Calliope Necklace" is a combination of most of the beads in the kit with a small addition of blue beads from my own collection for balance. It really stands out against my bright blue shirts. I also got the beads for the Royal Feather Challenge and can't wait!" Alison Herrington made these bracelets and necklaces. Here's what she had to say about them: "The flashing lights... the blinking lights... the blurred lights. The popcorn smell... the hot dogs and sauerkraut smell... the mechanical smell. The carmel corn... the cotton candy... the everything covered in chocolate. The screams of delight and laughter... the plink games... the beeping games. The twirling and whirling and spinning feelings in the pit of your stomach! This is what I tried to capture in my pieces. In the Ferris Wheel Necklace I used Andrew's polymer focal, orange Czech glass and blue sea glass as the "baskets". The Swings necklace uses red tubes from the kit and "swing" dangles made with various orange and red glass from the kit. The Merry-Go-Round Necklace is made without a clasp and in a random pattern of blue, iridescent, frosted cut glass round beads from my own stash. The Whip Necklace is made with both sizes of peachy orange Czech tubes as the "cars" of the ride. The Kiddie Ride Bracelet has one Czech glass tube as a focal and matches all the necklaces. I had a blast with this challenge!" Naama Eisenstein of Naama from Peculiaris made this matching set of earrings, bracelet and necklace. Here's what she had to say about them: "This is the first time I've taken part in such a challenge and it was even more fun than I imagined! I loved the image Andrew gave in the kit description of colorful festival lights as seen from a carnival ride. When I got the kit I could really see what he meant and wanted to keep this messy-joyful feel in my designs. It took awhile to think it out, but I'm happy with the results. 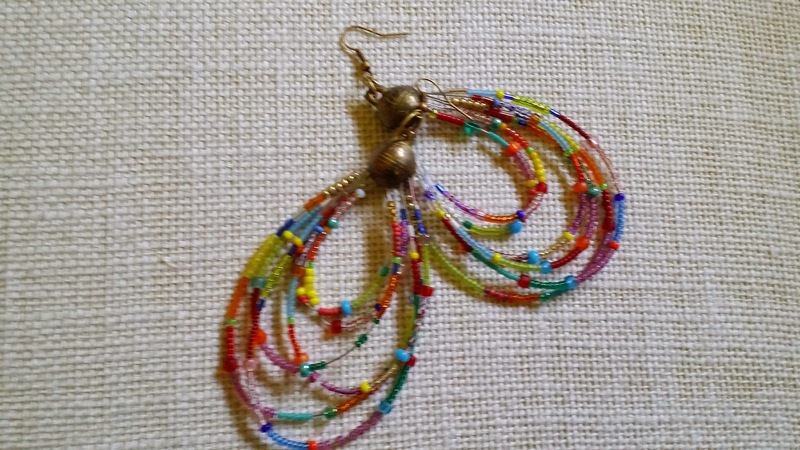 The earrings are long, dangly and have lots of movement." "This necklace/bracelet set is my main design from the kit. It can be worn as a collar-length necklace and separate bracelet, or the pieces can be attached and transformed into one longer necklace. If you want to see what else I've made from the kit, you can visit my Facebook page http://www.facebook.com/peculiaris"
This necklace was made by Crystal Lombardo Farrell. 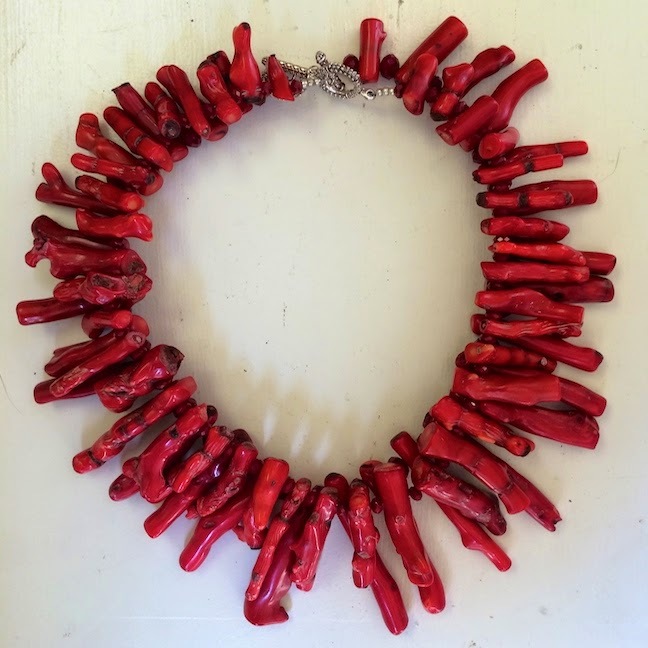 Here's what she said about the piece: "I took this challenge much more literally, and tried to make a necklace which was reminiscent of a string of carnival lanterns." This bracelet was made by me. The base of the bracelet is constructed with peyote stitch with a tube clasp. I embellished the edge with a random assortment of seed beads from the Luxury Bead Blend. On one side, I've stitched on holographic sequins that remind me of flashing carnival lights. 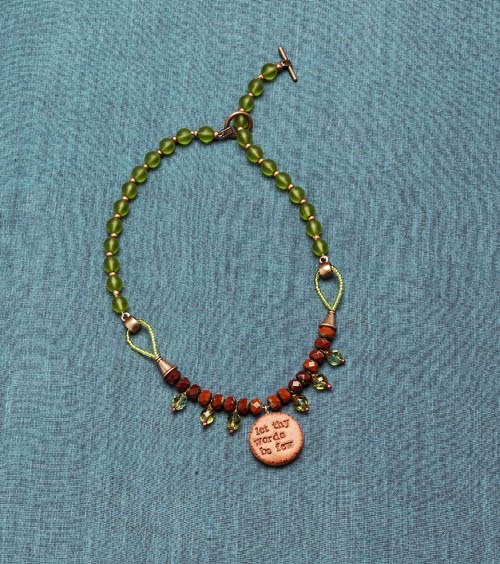 The bracelet is reversible, so it can be worn with either side facing out. But wait... that's not all! Please swing by the blogs of the other participants from around the world! Check out what they made for the Festival Lights Challenge! Up next is the Royal Feather Challenge! The reveal date is scheduled for October 16th! Check back here to see all the lovely creations! 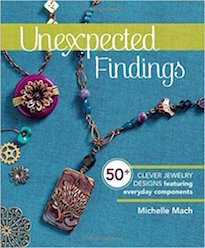 Earlier this week, I wrote about Michelle Mach hosting a blog tour to celebrate and promote her new book, "Unexpected Findings: 50+ Clever Jewelry Designs Featuring Everyday Components". The tour offers further insight into the making of this book and shares projects made by Michelle and the contributors featured in the new publication. PLUS there are fun prizes up for grabs! CLICK HERE to find out more about the blog hop and how you can win those prizes, including a Grand Prize of a $50 Etsy Gift Card! When I was asked to participate in this book, I was really honored and jumped at the opportunity. I love the concept! It definitely holds a special place in my heart. When I was first started out, I had studied fine arts, but had no formal training in jewelry-making. In the early days, I didn't always know what certain components were for and used them how I thought they should be. Sometimes my results matched up with their intended purposes... sometimes not. I also didn't have a huge budget then and often times had to make due with what was on-hand to achieve the look I wanted. Some of those early experimentations and substitutions were more successful than others, but the process instilled in me a curiosity and a desire to think outside of the box. Even now, after my collection of tools and beads has grown exponentially, I still turn things around, flip them over, and play. The goal is to look at things differently and see beyond what is "supposed to be". I think there's a sense of adventure when you're exploring what could be in your designs and examining the potential of a component. It's off the beaten path and can result in new discoveries. It was really fun coming up with these designs. I got to play around and try new things out and look at common components in different ways. I'd elaborate on the designs and the special techniques incorporated in them, BUT I don't want to spoil all of the surprises and encourage you to check the book out! To be entered to win one of the prizes, all you have to do is comment! You can comment on all eight participating blogs for a total of eight chances at winning! Michelle will randomly select a winner from the comment sections. For more information about the book, the blog hop, and the prizes CLICK HERE. I definitely recommend this book, and not just because I'm in it. It's packed with all kinds of useful information and innovative ideas of how to rethink everyday findings and give them new life. If you're interested in finding out more about the book and ordering it online, CLICK HERE. For a limited time, you can save 10% off! Use coupon code, "THORNTON10" to receive 10% off your purchase OR use coupon code "AT5OFF2)" to save $5 off of a purchase of $20 or more. Our neighbors at the shop have a beautiful garden. On nice days, it seems like there's at least a dozen or more people who stop to admire the abundance of brightly colored flowers. I have to confess that I'm one of them. I think that we're lucky to be so close and can enjoy them on a daily basis. The other day, I stopped to take in the technicolor dahlias, speckled lilies and sunny Black-eyed Susans. A storm had come through the night before and some of the plants had been slightly damaged. I noticed that a stalk of flowers had blown over and fell across our sidewalk. I bent down to right the fallen plant and paused to study the fanned out corona of pastel petals. At first, I was struck by the sheer beauty of it. It was so... pretty. As I looked closer though, I saw that the flower was damaged. Some of the petals were crushed and others were loose and fluttering off. The flower was teeming with insects. Small beetles had chewed the under-petals lacy, spiders had spun dew-splattered cobwebs, and tiny gnats swarmed around the slightly ragged center. What happened? A moment before, I was floored by how pretty it was and then... I was shuddering as I felt something scuttle across the back of my hand. At first glance, things can seem like absolute perfection. Under closer examination, you might find things that give you the heebie-jeebies. But then, as you consider that everything has its place in the Universe, the sense of beauty returns. The dying flower is all the more beautiful, because it exists in that moment. It is ephemeral. There have been flowers before... there will be more flowers in the future... but this flower is special. It is special, because it is the one here and now. While there may be other flowers in other gardens that are ever so similar, it is not the same. This flower becomes more than just a flower. It becomes a moment. The insects are part of bigger picture, of life, death, decay, and rebirth. The moment is a link in a chain that seems impossibly long and almost endless, but eventually connects back. Flaws might be discovered, but the beauty returns and it's a deeper kind of beauty. It's the beauty that comes with understanding and appreciation, and recognizing that the moment must be cherished because it is fleeting. Today is the REVEAL for the Mystery Component for the Royal Feather Challenge! Up until now, only the participants of the challenge were in the know. The Mystery Component is a polymer clay pendant made by me. Originally I thought I was going to make something with a peacock feather, but then I decided to throw a curveball and put the emphasis on "Royal" in "Royal Feather". So I made a pendant with a stylized crown motif. 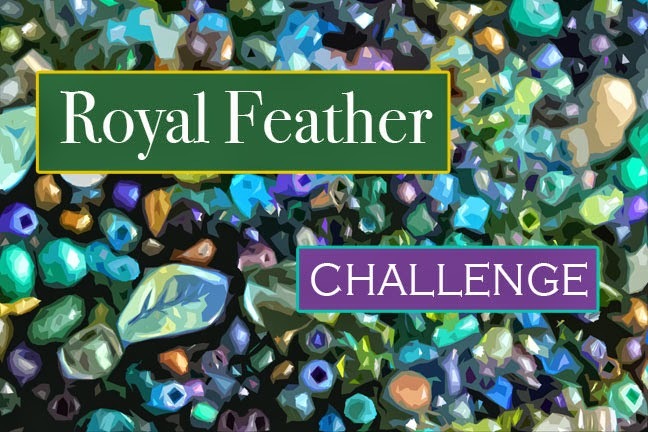 To find out more about the Royal Feather Challenge, CLICK HERE. And keep your eyes peeled for the Blog Hop Reveal of Festival Lights on Thursday, September 18th! 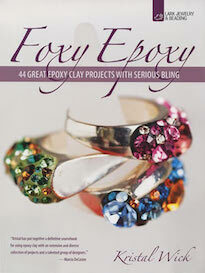 My friend and talented jewelry-maker, Michelle Mach, is coming out with a new book! 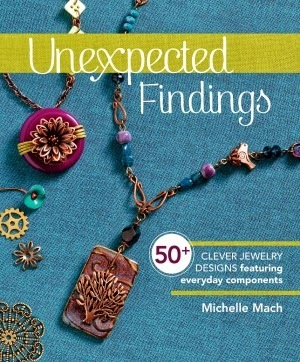 She and the contributors of, "Unexpected Findings: 50+ Clever Jewelry Designs Featuring Everyday Components" are sharing a little bit about the book AND she's giving away prizes to celebrate the new publication! To find out more about the blog hop and how to win the prizes, CLICK HERE. If you're interested in finding out more about the book, CLICK HERE. For a limited time, you can save 10%! Use Coupon Code "THORNTON10" to receive 10% off your purchase OR use "AT5OFF20" to save $5 off of a purchase of $20 or more. Sometimes you just need to use some leftovers! Cyndi has a cute earring project to share with you. The summer project of creating a dozen crafty cuffs is right on track. Number eleven is elephant themed! Did someone say Sparkle? Lisa has come up with a new mantra: Sparkle, sparkle, sparkle! Join her as she obsesses over shamballa beads. 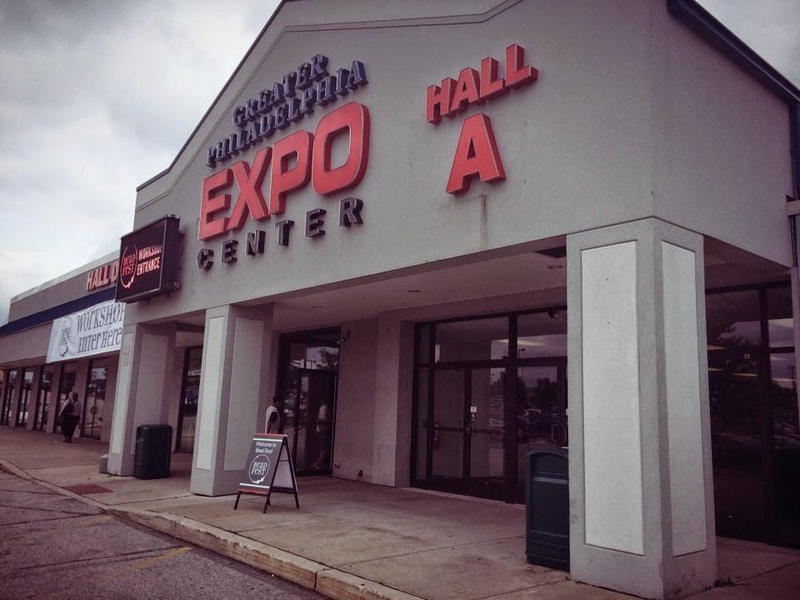 Andrew does a recap of his recent trip out to Philadelphia for BeadFest. 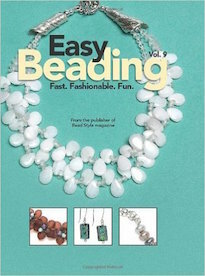 Jean reviews the wonderful new book by Jamie Cloud Eakin, "Bead Play with Fringe, Techniques, Design, and Projects". 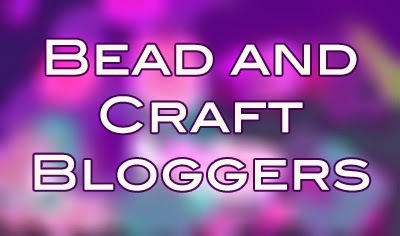 In the second segment of the episode of Beads Baubles and Jewels that I appear in, I show viewers at home how to make decorative bead caps using two-part epoxy clay. It's a fun technique to add texture, disguise a wire-wrap gone wrong, or to coverup a chip. If you're interested in step-by-step instructions, they've posted them online! CLICK HERE to see the tutorial. The great thing about two-part epoxy clay is that it cures rock-hard and can be customized with different textures, pigments, and embellished with chatons and flatback crystals. So you can let your creativity run wild with this technique. If you would like to see the episode I appear in (and are not in an area that airs the show), episode 2010 will premier ONLINE on Friday, September 19th starting at noon. Just visit the website and follow the links to the latest episode being shared. Did you know that I'm going to be on TV? Last year in November, I filmed an episode of Beads Baubles and Jewels with the lovely, Katie Hacker. The show airs on some digital PBS stations and I've heard from folks around the country that they've caught the episode already! If you're like me and live in an area that doesn't air the show on TV, you can see it online! The episode debuts online next week on Friday, September 19th starting at noon! Just CLICK HERE to visit the website. Initially, I was a little apprehensive, as this is the first time that I've been on TV. (It didn't help that I white-knuckled it through a lake effect blizzard to get to the studio.) But once I got there, I had a lot of fun. It was so nice to see old friends and make new ones! Katie and the crew were so patient and made the process a breeze! 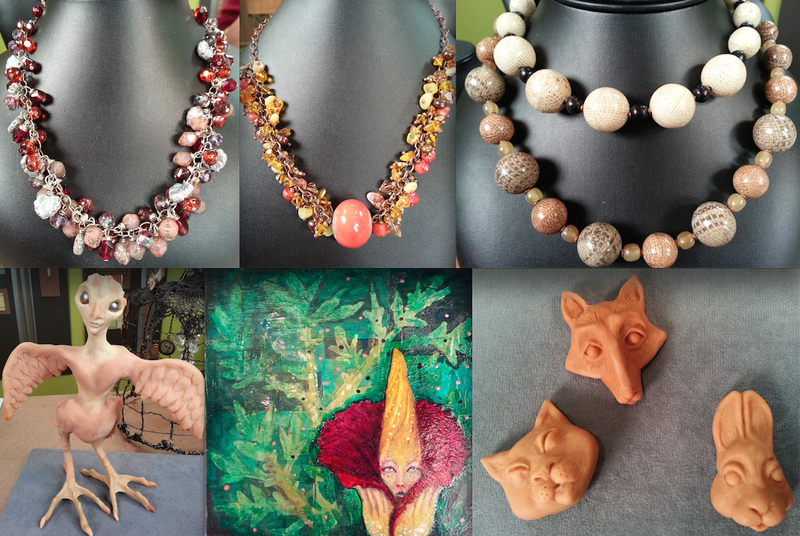 In episode 2010, "Art Inspired Jewelry Making", we quickly chat about my artistic background, blogging, and starting a business. Then we shift into the second segment, where I demonstrate how to make decorative bead caps out of two-part epoxy clay. 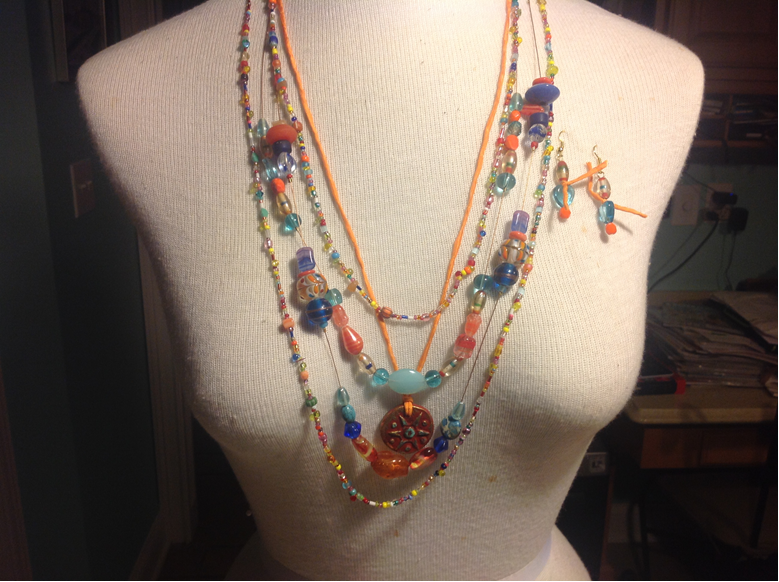 In the last segment, Katie shows how to make a necklace with beaded chain. She uses one of my porcelain pendants as a focal in her lovely (and easy-to-make) design! This is a necklace that I made using the epoxy clay bead cap. 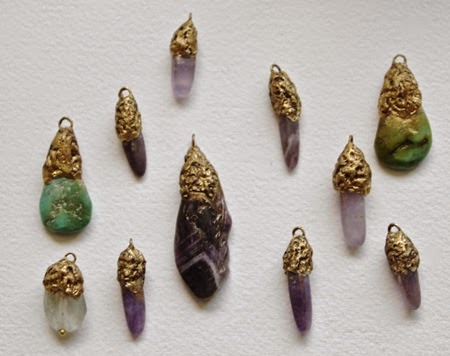 It's a wonderful technique if you've chipped a stone or want to add a little bit of an organic vibe to your wire-wrapped pendants. 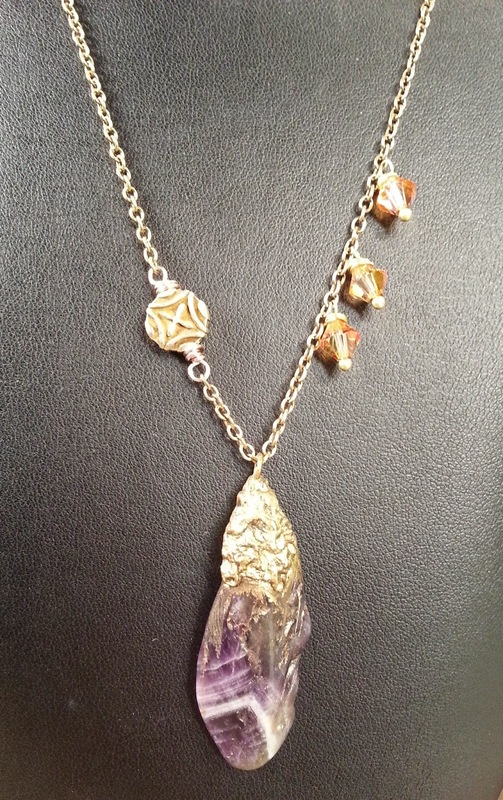 In this piece, I've used a piece of amethyst (embellished with the epoxy clay technique) on a length of chain with a vermeil spacer from Singaraja Imports and Swarovski crystal dangles. If you get a chance, I'd love for you to take a look and watch the episode. If you like it, I hope you'll comment with wild abandon and share the link. I had a lot of fun and would love to be invited back. 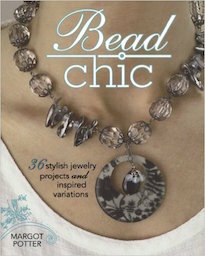 So make sure you check into www.beadsbaublesandjewels.com on Friday, September 19th starting at noon to see the episode! One of the things that I believe in fervently is education. It's a beautiful thing to want to hone your skills and broaden your horizons. I think it's important to challenge yourself creatively and push your understanding. Heather Powers of HumbleBeads wants to do that. 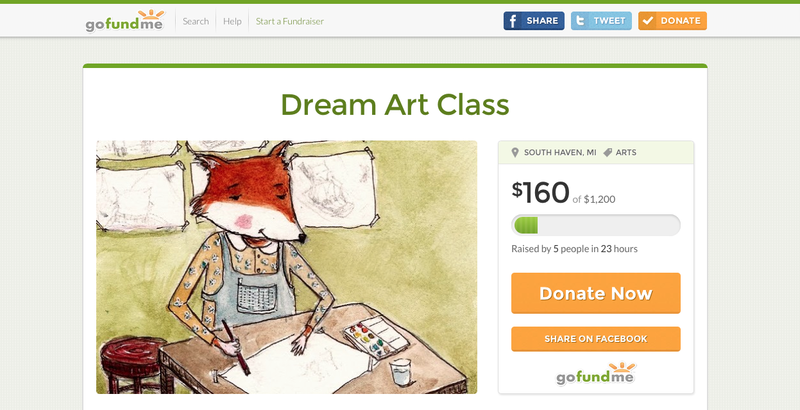 She wants to further her education with a "dream art class" and I want to see her do just that! Right now she is raising funds and I encourage you to take a look at her GoFundMe page. CLICK HERE to visit her fundraising page and help support a fellow artist's dream! While a good many folks in the northern hemisphere have autumn on their minds, Pantone is ever-looking forward and just released their Top Ten Color Selections for Spring 2015 Women's wear. The theme is "En Plein Air" and is all about unplugging from the modern world and returning to the serenity of nature. 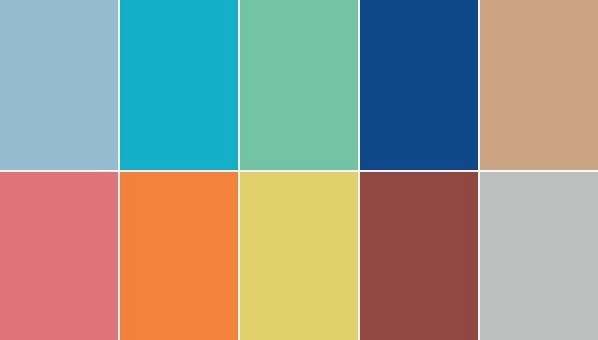 The top ten palette (with a notable amount of blue in different shades) is subdue and toned down, but utilize pops of bold color as punchy accents. I love how they describe this collection of colors. "An eclectic, ethereal mix of understated brights, pale pastels and nature-like neutrals takes center stage as designers draw from daydreams of simpler times. Remembrances of retro delights, folkloric and floral art, and the magical worlds of tropical landscapes restore a sense of wellbeing." CLICK HERE to read the full report. Many thanks go out to all the challengers who purchased Festival Lights kits! The Mystery Component Reveal is set for Monday, September 15th and the Blog Hop Reveal with everyone's creations is scheduled for Thursday, September 18th. I can't wait to see what everyone made! 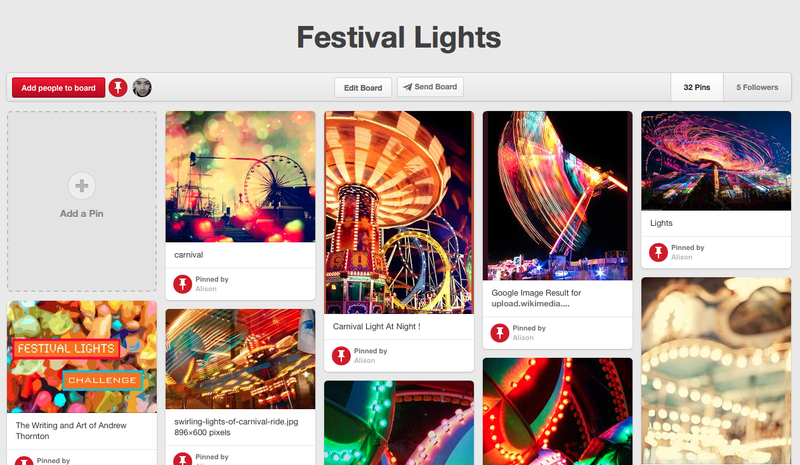 If you're drawing a blank with this challenge and need supplemental inspiration, there's a new Festival Lights Pinterest board! One of our regular challengers and a friend of the shop, Alison Herrington, started the boards for each challenge. I've even added a pin or two to some of the boards! To check out the Festival Lights board, CLICK HERE. We also started a new Facebook group for the challengers! It's a great place to keep up with current announcements, share in inspiration, and keep in touch with your fellow challengers! CLICK HERE to check out the Facebook group. I have a sweet resin project on Scrapbooking.com's blog this week. Paper Embellishments with Jewelry Resin featuring vintage postcards. A good experiment in resin layering results in some one-of-a-kind "cubes of resin". I bet you have your own sources for inexpensive craft supplies. Here are some of my faves! Do you have any others? 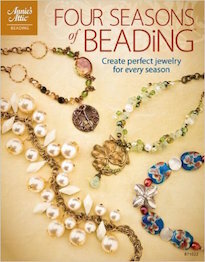 Cyndi has a review of a fabulous new book by Lark Crafts called, "Beading All-Stars". All your favorite designers in one gorgeous package! Video podcast episode 4 including some "rockin" jewelry and a litter fiber too. I'm super excited to be returning to New York City! It'll be the first time that I've been back since we moved to Pennsylvania. I'll be teaching at The Whole Bead Show at the Metropolitan Pavilion! If you're in the area, I highly encourage you to come out for the show! Not only will I be there, but so will a host of awesome vendors from across the country! The show runs from Friday, October 17th to Sunday, October 19th. I'll be teaching two classes while I'm there, and they should be a lot of fun! CLICK HERE to see the full list of classes at the event. The first class that I'll be teaching is called, "Making Faces". Students will get a crash course in sculpting faces. 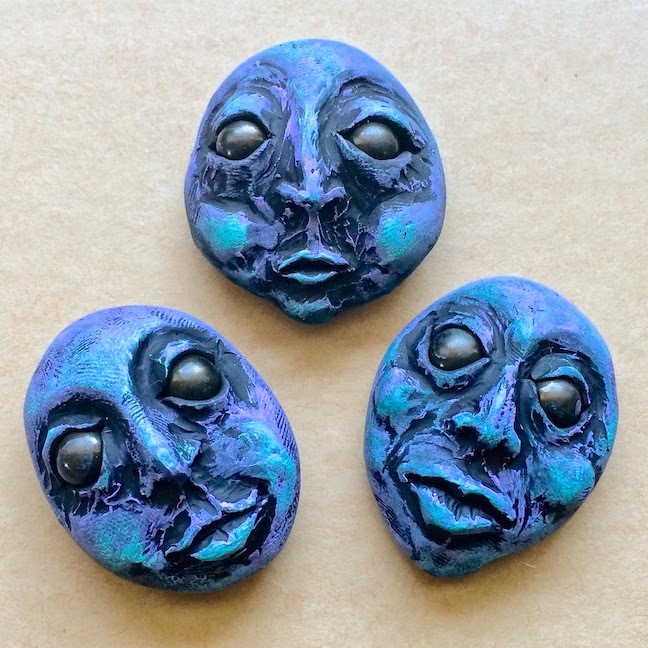 The polymer clay creations can be used as cabochons in bead embroidery, turned into pendants, or utilized in art doll projects. Class will cover the basics of working with polymer clay, creating customized sculpting tools, and finishing options for the sculptures. The class will be held on Friday, October 17th from 4PM to 6PM. It's only $55 and covers materials as well as my teaching fee. The second class that I'll be teaching is the "Mixed Media Mod Brooch". 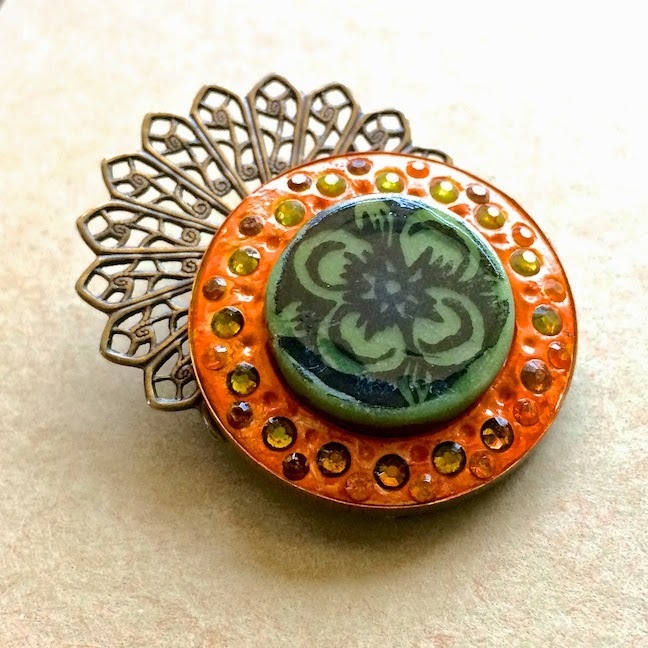 This fast-paced class will cover several mixed media techniques like simple brooch fabrication, image transfer on polymer clay, and working with two-part epoxy clay. Students will create customized tools and learn useful techniques that have endless possibilities and applications. In the process, they'll create a fun pin-back brooch! The class will be held on Saturday, October 18th from 10AM to 12:30PM. This class is also $55 and covers materials, tool usage, and my teaching fee! I wanted to keep the classes as affordable as possible to make them as accessible as I could. (I'm even couch surfing to keep my expenses down to keep the class fees down.) The classes are small with a maximum of 10 students in each class, so if you're interested, make sure to let me know ASAP! You can call the shop 724-610-37770 or you can email me. I'll be putting together invoices for interested students this upcoming week and will be taking sign-ups until the day of the classes (unless they fill up first). Speaking of the Whole Bead Show, did you know that you can keep up with the vendors, classes, and events in their Facebook group? CLICK HERE to check out their new Facebook page! It's a great way to keep an eye on all the show goodness! It's been a little while since we made our way out to Philadelphia for the BeadFest show. After the big shows, I always feel a little blue. The shows are a convergence point of some of my favorite people and artisans – a swirling, melting pot of creative energy that fills the air like iridescent bubbles. Once I'm home, I miss my tribe. I miss that crackling energy. I miss all the beautiful things that line the maze of tables and convention center blue and white cloth dividers. And usually, I throw myself into my work to lessen the brunt of that absence. I go through a ritual of unpacking our purchases, looking at photos and slowly easing back into the day-to-day routines. There's a finality to doing the laundry, folding the clothes, and then writing about the experiences on the road. We didn't know if we were going to go to the show at all this year. I had just come back from a trip to North Carolina, where I attended a gem show in Franklin. Realistically, we didn't need to restock so soon, but we wanted to see all our friends and familiar faces... so at the last minute, we made plans to go to BeadFest. Kate Richbourg of the Gaston Collective, Genea Crivello-Knable, Staci Louise Smith, and Joan Eckard. Kay (with a picture of her new baby) from Star's Clasps, Diana Ptaszynski of Suburban Girl Studio, Linda Landig, Lesley Watt of THEAElements, and Maureen Henriques of Pumpkin Hill Beads. Helena Hui of Pearl Concepts, Jill Wiseman, and Bernadette Fuentes. Diane Hawkey, Ashley Bunting, Elisa Jennings Sullivan of Swirls Jewelry, and Patti Bullard of Wubbers. Candie Cooper, Brenda Schweder of Now That's a Jig, Nealey Patel who wrote, "Jewelry for the New Romantic", and Eva Sherman. Yvonne of My Elements by Yvonne, Abby and Ashley (again) from Xuron, and Marsha Minutella of Marsha Neal Studio. Marti Brown of the Dragon's Odyssey, Liz and Sak of Saki Silver, and Leslie Pope of Twisted Sistah Beads. Karen Totten of Starry Road Studio, Heather Powers of Humble Beads, Anne Gardanne, and Jolene from Bazaar Star Beadery. Tammy Honaman, Katie Hacker, John and Janice Evert, Jenny Davies-Reazor and Sue Kennedy. (I usually don't post pictures of myself in my recaps, but I liked this picture that Perry Bookstein of York Beads took of me and Jennifer VanBenschoten of Beading Daily, Sunyoung of Ezel Findings and my brother-in-law, Greg, from Green Girl Studios. Greg is currently working on a music project called Burn Report. CLICK HERE to check it out. Near the end of the show, I took a panoramic of the convention center. While we were in the area, we were fortunate enough to help celebrate Margot Potter's birthday and their return to Pennsylvania. Their home and studio are super cute! I love their separate little red studio building. I'm excited for the Potter family and looking forward to seeing all the great projects that they have in the works come to fruition. We also got to see William's former roommate, who showed us around the city. It was nice to walk around and explore. We had a tasty meal at Khyber Pass Pub. (They had excellent pulled pork and brisket!) 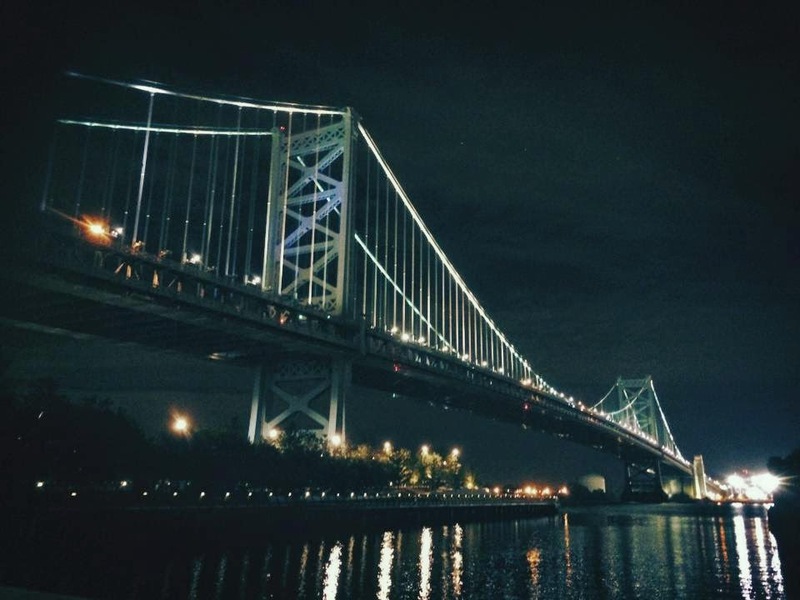 We then headed over to see the lights at Spruce Street Harbor Park. After walking around the waterfront for a bit and enjoying the festive lights, we met up with a group of people to Morgan's Pier for dancing, drinks and fireworks. The weekend was packed with friends both old and new, beautiful things, and good times. Until next time, BeadFest!